Replacing worn tyres — we know it has to be done, but most of us do it with a sigh. Tyres aren’t cheap (even BK Tyres’ competitively priced ones), and we’d much rather spend our money on something else. The good news is that changing a few habits, and shopping wisely, can lead to much slower tyre wear and less frequent tyre changes. So, let’s look at the top reasons tyres wear quickly and what you can do about each of them. 1. Your tyres are under-inflated. Under-inflation causes faster wear on the edges of tyres. This is because under-inflation reduces the footprint from the central portion of the tyre. More weight rests upon the stiffer edges, leading to faster wear. Many motoring websites focus on the poor fuel economy from under-inflated tyres. But if tyres are only little bit under-inflated, actually the effects on fuel consumption are only modest. It’s the loss in tyre mileage that will really hit your wallet. According to TyreSafe, under-inflating your tyres by just 10% could lose you the same percentage in tyre mileage. So, for example, if a 32 psi tyre with a nominal 20,000 mile lifespan is underinflated by just 3psi, its lifespan could drop by 2,000 miles. You might think that if under-inflating a tyre makes it wear faster, then over-inflating them will slow wear down. 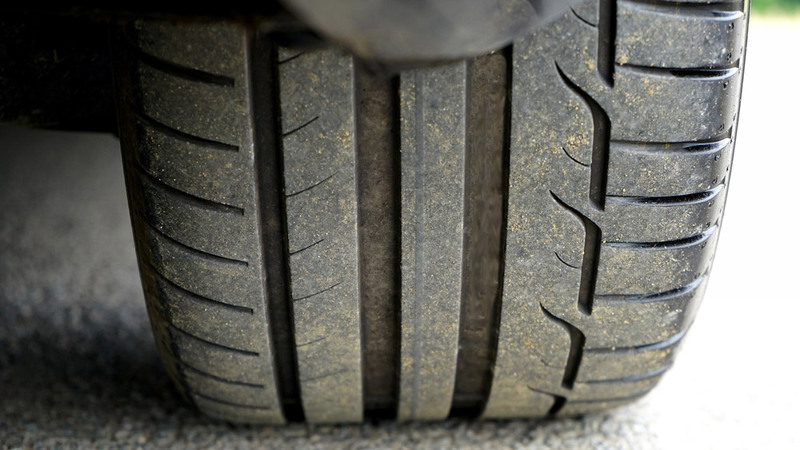 Over-inflating tyres also leads to accelerated wear. However, this time it’s the centre of the tyre that suffers. The simple solution for both problems is to check inflation pressures regularly. Left to their own devices, tyres can lose 1-2 psi per month, and don’t forget that pressures change with the ambient temperature. One of the biggest factors affecting tyre lifespan is driving style. Aggressively accelerating and braking, cornering at speed and so on all take their toll on your tyres. For real-world examples, take a look at a thread on the motoring enthusiasts’ site, Pistonheads. Users there report getting anything from 500 miles to 80,000 miles from their tyres. The differences relate to type of car, type of tyre (see below) and driving style. To get more out of your tyres, drive smoothly. Learn to anticipate the road so that you don’t accelerate or brake more than you need to. Yes, this is less fun than hooning around, but if you reduce the demands on your tyres, you’ll be repaid by less frequent changes. Problems with the suspension and/or alignment can cause a host of tyre-wear issues. For example, bent struts or collapsed control arm bushings can lead to camber wear on the tyre’s edges or shoulders. Unless you’re mechanically-minded, the only real solution to this is to visit a tyre expert who can offer a diagnosis. We know all tyres just look like black hoops, but the truth is that they’re not created equal. The quality of tyre you choose can make an enormous difference to how long it lasts. For example, one haulage company found that they were getting around 17,000 fewer miles out of their tyres when they switched from premium Bridgestones to a budget alternative. That’s a huge (and expensive) difference. Does this mean that you should pony up for the most expensive tyres that you can afford? Not necessarily — it’s a bit more complicated than that. Whilst it’s true that premium tyres generally offer better mileage than cheaper brands, there are certain brands or even individual tyres that buck the trend. There are some great mid-price tyres which are more durable than expensive, premium brand tyres. This makes choosing a long-lasting tyre hard work for the consumer (especially as independent wear tests can be hard to find online. All that we can suggest is to find a reputable fitter and listen to what they suggest. For our money, GT Radial are a company that offer a brilliant balance between durability, price and performance. They’re such a good all-rounder that we’ve made them our star buy! BK Tyres is a respected independent mobile tyre-fitting company that serves Oxfordshire, Buckinghamshire and Berkshire. We fit tyres at home and at work, offering excellent customer service and competitive prices.